The world oceans host a wide range of natural resources, including fish and fossil fuels. Development and utilization of these resources generates obvious economic value. Yet, development and utilization also generates less obvious ecological cost. The challenge of course is in finding a balance between the two. This is easier said than done, and I am by no means here to tell you what to value more and what to value less. What I can do, however, is provide information - information that you can use to inform your own opinions and decisions. First, let’s talk fish. According to the Food and Agriculture Organization of the United Nations (FAO), as of 2009, 87.3% of global fish stocks were fully or overly exploited (FAO, Fisheries and Aquaculture Technical Paper 569, 2011). This same report indicates that in 1974, the total was only 60% of global fish stocks. These findings demonstrate quite clearly that, when it comes to fish, the balance between economic and ecological values has shifted towards economic and away from ecological over the past 40 years. Humans are benefiting from the development and intensification of fisheries at the cost of the marine ecosystems that host these fish. The growth of fishing manifest in the FAO’s analysis of fish stocks presents a variety of potential threats to migratory whales. Unsustainable fisheries have the potential to remove important food sources for whales. The long-distance migrations of humpback whales are energy intensive. If a whale has to search harder and longer for fish to eat in order to replenish its energy-rich blubber, it has a lower probability of survival. Whales are also known to collide with ships. If ships and whales are in the same areas at the same times, the probability of collision obviously increases. Many whales bear the scars of such collisions. 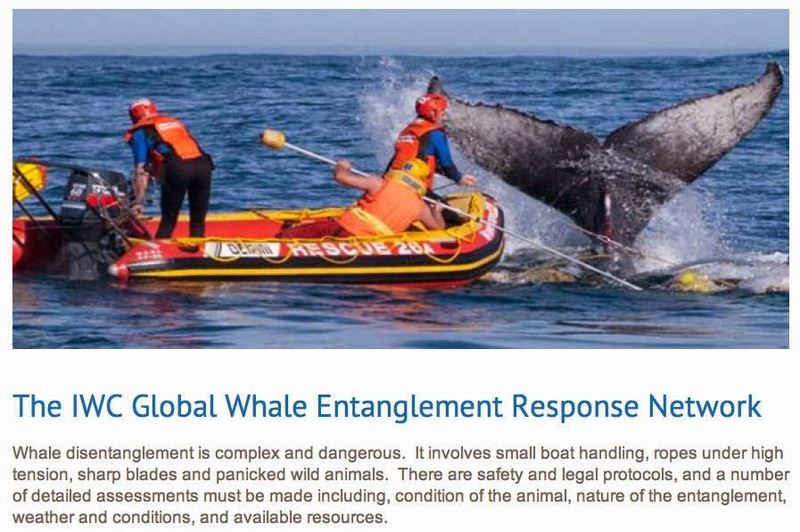 Yet, the fishing gear itself is perhaps the most significant threat to whales. The International Whaling Commission estimates that 308,000 whales and dolphins get entangled in fishing gear every year (nb – some sources suggest that as many as 50,000,000 sharks are caught every year as bycatch in global fisheries). For the whales (and sharks) of Oceania, it is the long-liners targeting tuna that pose the greatest threats. Every fisherman and fisherwoman I have ever met is sensitive to these issues. By in large, they don’t want to overfish the seas and inadvertently kill whales (nor sharks). People who fish for a living know the ocean. They know and value the ocean and all it supports. They want to find balance just as much as anybody. In my opinion, the only way to meaningfully resolve the inherent competition between economic and ecological values associated with global fisheries is to accommodate both. The only way we can make the appropriate accommodations is to collect data and analyze it in an integrated way – a way that values and respects the value of both fishermen and fish, dollar for dolphin. Now, let’s talk about oil and gas. This one is a bit trickier as, unlike fish, oil and gas are both non-renewable resources, at least over human time-scales. Once we’ve burned them up, they’re gone. Yet, despite the well-known fact that oil and gas are non-renewable resources, we continue to extract more fossil fuel every year from the world oceans – at exceedingly high risk to the marine environment. According to data published in an Oil and Gas Journal article (Sandrea and Sandrea, 2010), the amount of oil extracted from offshore resources has increased ~600% since 1974. The offshore development of oil and gas is a classic out-of-sight, out-of-mind facet of our everyday lives. I would venture to guess with some confidence that most New Zealanders aren’t aware of the fact that earlier this year (2014) the government opened up 1456% more ocean floor space to resource exploration than it did in 2002, the first year an open tender block offer approach to marine development was used in New Zealand (395,800 km2 in 2014 versus 27,184 km2 in 2002). 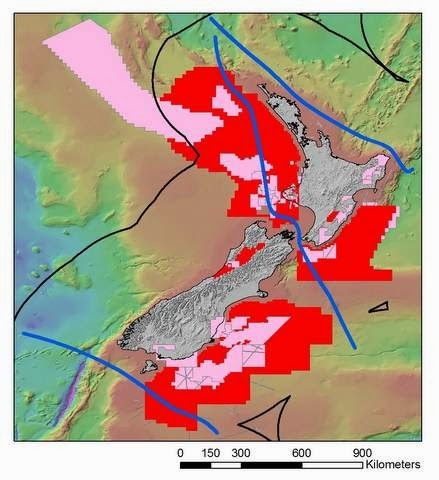 Known humpback whale migration corridors (blue lines) and offshore oil and gas development permitted areas (pink) in the New Zealand sector. Red area shows the area available through the New Zealand government's 2014 block offer. Black lines show the boundary of the New Zealand EEZ. Bathymetry courtesy of NIWA. Now, this is not to say that all of this ocean floor will in fact be developed. Rather, these numbers simply represent the total area of ocean floor the NZ government has put on offer for possible exploration and development – both processes that require rigorous assessments of environmental impacts according to New Zealand’s Resource Management Act. But to put the above facts in context, only 0.5% of the New Zealand marine environment is afforded some form of official protection. This equates to ~20,000 square kilometers of protected area - one-twentieth the size of the 2014 New Zealand offshore oil and gas block offer. For both fish and fossil fuels, there appears to have been a prolonged shift in values towards economic and away from ecological. Values aside, development of the world oceans is steadily increasing. There are very real benefits that will result from this development and it will be an important part of a secure future for billions of people across the planet. The New Zealand government alone gets $400 million in oil and gas royalty, and an additional $300 million in oil and gas company tax, every year (Ministry of Business, Innovation and Employment, Economic Development Group Occasional Paper 12/07, 2012). The key questions I would ask are: On balance, how secure is our future? And, what are the ecological costs of marine development? To provide answers to these questions we need science. We need data. In short, we need a global effort committed to finding the right balance between development and conservation in a rapidly changing world.